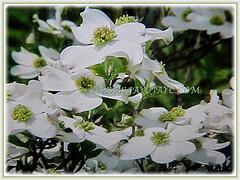 Common Names: Flowering Dogwood, White Dogwood Tree. Etymology: The genus name Cornu comes from the Latin word horn meaning in probable reference to the strength and density of the wood. The specific epithet flos comes from the Latin word flos flower in reference to its attractive spring flowers. Origin: Native to the eastern North America and northern Mexico. 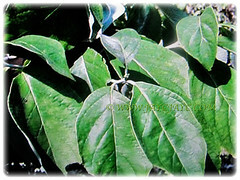 It is widely cultivated elsewhere around the globe..
Plant type: It is a flowering tree. 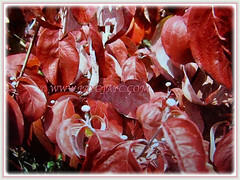 Features: Cornus florida is from the genus, Cornus that consists of approximately 50 species. It is a small and deciduous flowering tree with low branches that grow to an average between 6.09-7.62 m tall and spread as wide. Usually, it has a flat-topped crown and is wider than high when mature. 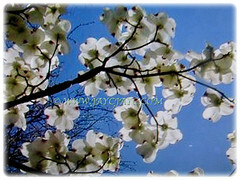 The Flowering Dogwood occurs as a single or multi-trunked tree and has multi-layered branches. Its opposite and simple leaves are 7.6-15 cm long and oval. Leaves are bronze-green to yellow-green as they unfold, then turn to dark green. Fall colour tends to be red to reddish purple. 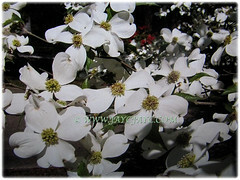 Flowering Dogwood is recognized by most people for its spring floral display that can be white or pink and even red. The showy part is actually a leaf-like bract under the tiny flowers. 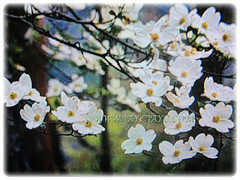 Flowering Dogwood has lovely flowers in spring, attractive foliage in summer and fall. Colourfull fruits in fall and an interesting growth habit that provides winter interest. True flowers are greenish yellow and insignificant. The inflorescence consists of four showy petal-like bracts, usually snow white or pink, surrounding a cluster of tiny inconspicuous yellowish flowers. The bracts are 2.5-5 cm long and obovate in shape, usually with a cleft at the tip. Blossoms are effective for 10-14 days. Clusters of bright red football shaped fruits, about 1.27 cm long, follow the showy flowers. Fruit is a glossy red drupe that ripens and can persist for a long time. 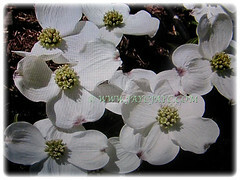 The white petals of the Dogwood flower are actually leaf-like growths called bracts rather than true petals. The actual flowers are in the cluster at the center of the dogwood bloom. The showy bracts can attract pollinating insects to the flowers. 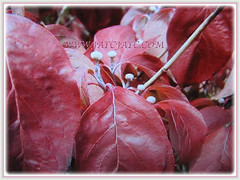 Wild Dogwood Tree normally bloom in white but pink and red varieties also occur. Culture (Care): Cornus florida or Flowering Dogwood grows easily with the least maintenance. Light: Best in semi-shade but can tolerate full sun. Others: Branches droop as the tree grows and may require pruning to allow pedestrian or vehicle traffic. Feed the plant with a balanced fertiliser once fortnightly. Prune your Dogwoods before your tree breaks dormancy. Pruning Dogwood can help shape them and improve their health. Remove any dead or damaged branches. Also, remove any branches that are touching or rubbing together. This way they won’t have unclean breaks on their own. Thin the center of your tree to allow more air circulation which can prevent molds, fungi and mildews from growing. Generally free from serious garden pests and diseases. However, powdery mildew, cankers, phytophthora, leaf blight may be a problem. For subtropical and temperate regions: Hardiness: 5-9. Cornus florida or Flowering Dogwood is a common ornamental landscape tree that offers something nice throughout the year. 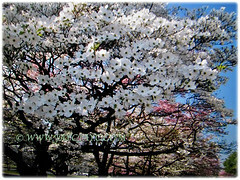 The tree provides showy white flowers in spring, rich green foliage in summer, bright red leaves in fall and red berries relished by birds and animals all winter. The tree provides showy white flowers in spring, rich green foliage in summer, bright red leaves in fall and red berries that are relished by birds and animals all winter. Propagation: Easily propagated from greenwood or hardwood cuttings. Usage: The tree is commonly planted as an ornamental in residential and public areas because of its showy bracts and interesting bark structure. The wood of dogwood has a high resistance to sudden shock, making it a popular choice for making golf club heads and chisel handles. It is also used for mallet heads and wedges as it can be hammered on the ends without splitting and mushrooming out. It was once used to make hay forks, hubs of small wheels, rake teeth and machinery bearings because it wears smoother as it is used. Ninety percent of dogwood cut since the late 19th century has been used to make shuttles for the textile industry. Native Americans used it as a treatment for malaria. 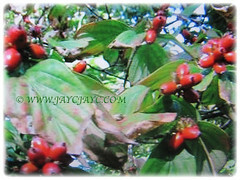 Tea made from dogwood bark was used to induce sweating to break a fever. Squirrels and birds devour the pretty red fruits.